A new paper by Levin, A. et al was published open access in Scientific Reports entitled, “Joint effects of pregnancy, sociocultural, and environmental factors on early life gut microbiome structure and diversity.” The paper confirmed a lot of what we already now about what factors influence infant gut microbiomes (ex. breastfeeding, mode of delivery, pets, etc). However, there were two unique aspects to this paper: (1) they included race and socioeconomics into the analysis (made possible by the fact they actually sampled a diverse cohort in the first place compared to other studies) and (2) are apparently the first research group to take a multi-factor approach. I’ll be honest – I found the multi-factor approach a bit confusing. The authors mention this means they used a “backwards variable selection” procedure/approach, which I understand as an iterative process where you fit the data to a model (by variable), drop the least significant variables, and re-fit to the model until all variables are significant. What surprised me is how much this approach changed the data (see attached figure comparison): different variables were significant in the multi-factor analysis compared to the single factor analysis and vice versa. Significant differences were correlated to demographics (eg marital status and ethnicity), but very few confounding variables were considered in the discussion or analysis that could also explain these differences. This is not to say the authors lacked attention to detail; capturing the whole picture would be nearly impossible. 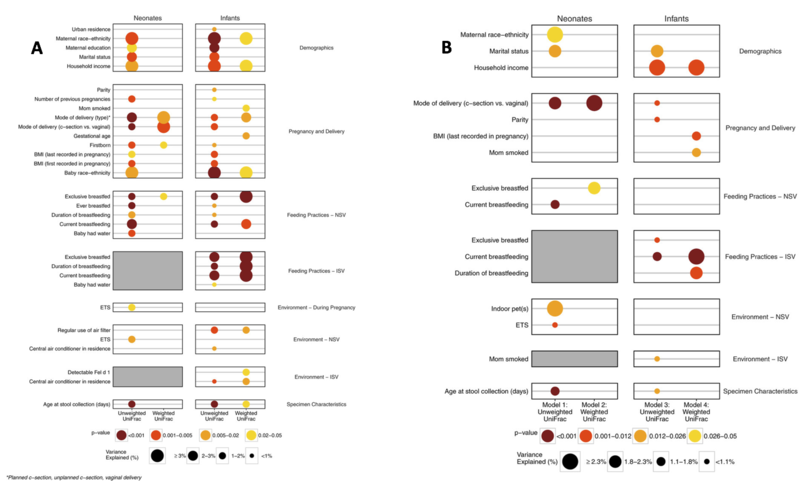 There were fascinating details included that I would never even think of, such as the type of C-section (planned vs unplanned) was correlated to significant differences in the gut microbial community composition of infants. Lastly, there is a cool network analysis in this paper that represents a bold attempt to connect variables associated with pregnancy (mode of delivery, previous pregnancies, etc), sociocultural (race, income, etc), and environmental (tobacco smoke, air filter, etc) factors. Overall, a well-done study and cool analysis tools/visualization – worth the read!